Lean and Clean is your opportunity to experience something new by focusing on nutrition and new leaning methods. Prepare to be physically and mentally challenged like never before. Lean and Clean is a 12 week program that will get you results. You will be expected to put in 100% effort at all times. You will upgrade your entire level of fitness, learn nutrition habits and guidelines along with lifelong exercise habits. 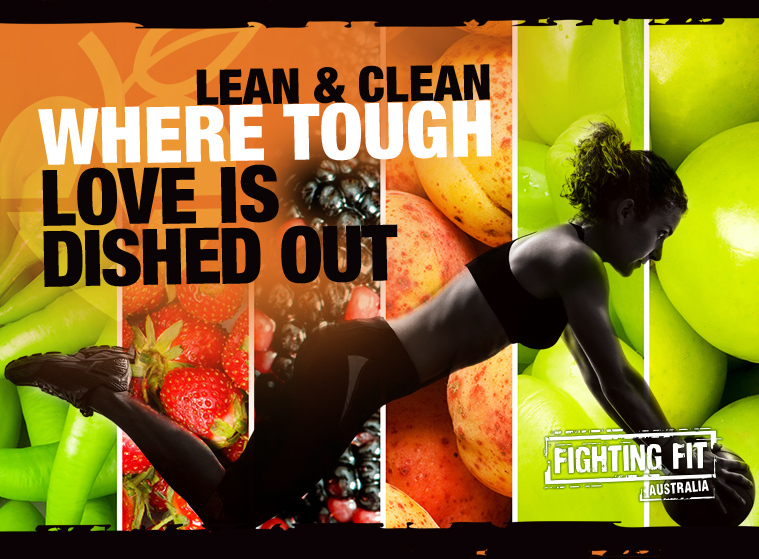 The Lean & Clean crew will meet at Fighting Fit for each session. Please be five minutes early. Monday to Friday at 5.30am, 9am or 5.30pm & Saturday at 6.30am. All session will be run for 60mins. A deposit of $200 required to secure your spot and 8 weeks to pay the remaining balance prior to completion of program. Lose body fat whilst increasing lean muscle mass. Get fit seriously fast. Focus on a positive mindset change. Enter into your own Private Facebook group. Be motivated to do things you thought you weren’t capable of. All sessions will be scaled for all fitness levels. Be prepared to be physically as well as mentally entertained every session. We will also review your Health Questionnaire, Goal Setting Worksheet and answer any questions you may have. Train hard, laugh loud & have fun. 100% planning, effort and dedication to all training sessions. Physical Training Component – All sessions will be programmed by highly qualified Fighting Fit Australia coaches. Nutrition Component – Nutrition to suit your individulised needs tailored by Tess and Cara. Tough love will be dished out.